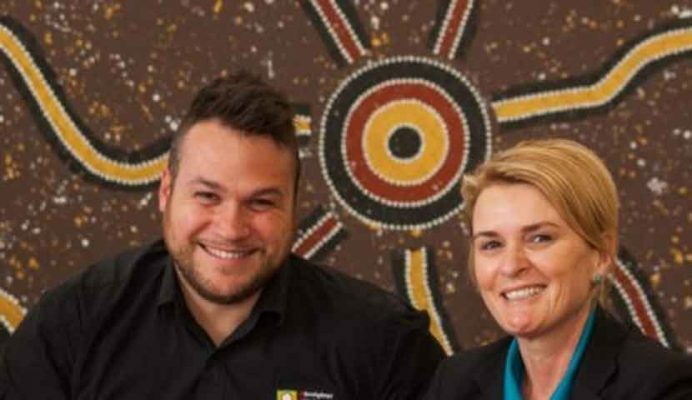 Two of Newcastle’s key Aboriginal and Torres Strait Islander services, the Aboriginal Employment Strategy (AES) and Awabakal Ltd, have formalised an ongoing partnership to improve employment and health outcomes for Indigenous people in the Hunter and Central Coast region. The partnership will involve the development of specific recruitment and training opportunities in the health sector for Aboriginal and Torres Strait Islander people, and closer communication between the organisations to improve their services, and the support and mentoring for Awabakal staff. “Building partnerships with likeminded services is key to improving the health and wellbeing of Aboriginal and Torres Strait Islander people of the region,” says AES Newcastle, Hunter and Central Coast Business Development Operations Manager, Leroy Wilkinson. “Awabakal is one of the largest Aboriginal organisations in the Newcastle region. They have comprehensive primary health care services, Aged Care, social and emotional wellbeing Preschool and dentistry, so they’re quite diverse in what they do for the community. The AES office in Newcastle was established in 2006 and services a broad area that encompasses Newcastle and Maitland, and reaches as far as Scone and the Central Coast. Awabakal was established in 1973 (then known as the Newcastle Aboriginal Advancement Society) and has grown to become the largest Aboriginal community owned and run organisation in New South Wales, providing services to Indigenous people living in the Newcastle, Lake Macquarie, Port Stephens and the Hunter Valley. The new partnership between the organisations will primarily involve the AES assisting Awabakal with their human resources practices. “Recruitment is what the AES specialise in; we can make sure Awabakal is getting the right people for the right jobs, and we’ll also look at training opportunities, so we can forward plan for workforce development, succession and new opportunities,” says Leroy. According to Awabakal CEO, Raylene Gordon, partnering with the AES will allow Awabakal to improve its services while building capacity within the organisation and the local Indigenous community. “My philosophy is that your organisation is only as good as your people. We’ve got over 80 staff and the majority of them are Aboriginal people; we’re trying to grow our Aboriginal workforce and provide career pathways, and I think the AES can help us do that,” says Raylene. Raylene says that Awabakal have faced some challenges in recruiting local Aboriginal staff in the past. “One of the issues has been with the way we advertise, the way we’ve written our jobs and the way people perceive the jobs. They look at the job description and think ‘I can’t do that’. Job security has been another issue, so I think partnering with the AES will help us to build our reputation in the community as well. So it’s not just us saying ‘come and work for us’, it’s another Aboriginal organisation vouching for us,” says Raylene. Awabakal have established partnerships with other Aboriginal services in the region, while the AES is also pursuing a long-term of strategy of partnering with other key Aboriginal services. “These types of partnerships are evidence of innovation in the space; it’s a show of strength across community to show that we can work together to achieve broad outcomes, and it’s about that holistic approach which is the key to meaningful collaborative success,” says Leroy. For Raylene, a closer and more productive relationships between Awabakal and the AES will only lead to one outcome. Cap: AES Business Development Operations Manager Leroy Wilkinson and Awabakal CEO Raylene Gordon.